Mr RiggCheck (Nils) went through our rigg 2-3 times every day. We are very releaved that he was so consistent on his checking as we did find things to either repair, replace, screw on better again in order to prevent any damage. Tack Nils! 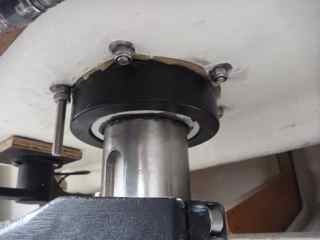 However Nils could not prevent this… The day before the official start of the ARC on Saturday the 22nd we discovered that we had problems with the rudder, bolts not holding properly. 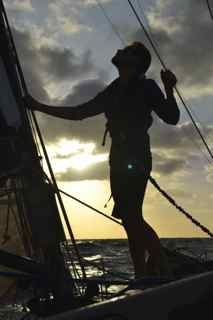 We worked all Saturday and Sunday (we thank the winds forcing the ARC to postpone the start!) 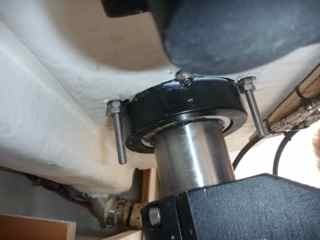 in order to find the source of the problems and then replacing the bolts. 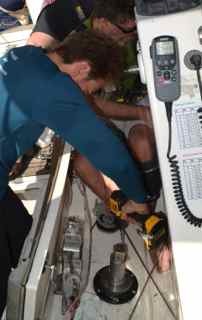 Confident we left the harbour of Las Palmas on Monday 24th of Nov. 5 days later Nils did a safety control of the rudder and found this…. The new bolts had been worn out / shafed (? )and were broken! This time it felt really serious. Can we continue?? Shall we go back to Cap Verde? 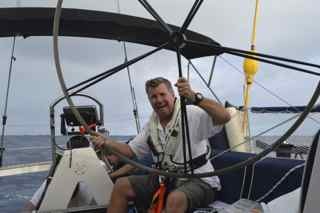 We called expert friends in Sweden and emailed Lasse on Sandvita who had helped us out before the start. Luckily our Mr Mac Giver, Nils again, had spare bolts with him of 8 mm. So he did new wholes and replaced all the previous bolts with these bigger bolts. 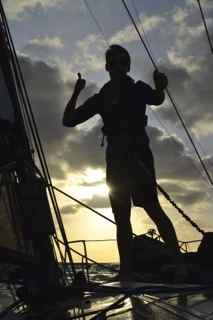 After 3 hours with sails down facing the boat towards the wind we were off again!